Already in the ring, Paige welcomes everyone to the show. She also welcomes Becky Lynch. Becky heads to the ring. Lynch says that she has shown up to fight every night, but she’s been stopped since the RAW invasion. Now, she will not be stopped. She would also like to address what happened at Survivor Series, so Lynch calls Charlotte Flair to the ring. Flair obliges. Lynch tells Flair that she asked her to give Ronda Rousey the beating Lynch would havem and Lynch says Flair came close. But if Lynch had been there, Rousey wouldn’t have been standing the next day. Flair says she wasn’t trying to be Lynch, she was just being herself when she beat up Rousey. Flair says she is more capable than Lynch because she is genetically superior. Lynch says Flair just went from copying her old man to copying “The Man.” Flair claims Lynch is copying both Ric Flair and herself, and Lynch is still riding her coattails. Flair will be at TLC, and she’s willing to fight Lynch right now. Paige calms things down. She likes what she’s seeing from both women. At TLC, Flair when face Lynch for the title, and it will take place in a Tables, Ladders, and Chairs match. Suddenly, Mandy Rose comes out to the stage along with The IIconics, Sonya Deville, and Zelina Vega. Rose thinks any of them could have done the same thing to Rousey that Flair did. Rose thinks any one of them deserves a title shot just as much as Flair. Rose wonders why Paige is overlooking the rest of the women’s division while only giving opportunities to her old PCB teammates. Naomi comes out to the stage along with Carmella, Lana, and Asuka. Naomi agrees with Rose. She says that the entire women’s division can be champ. Paige is still happy with what she sees. 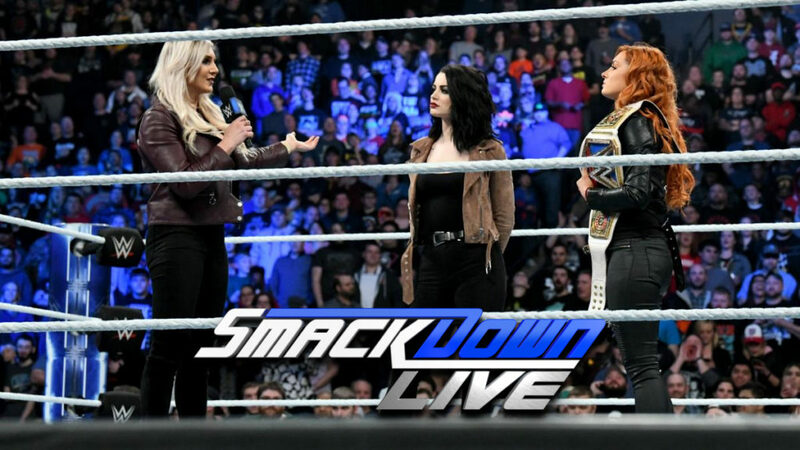 Therefore, the entire women’s division (minus Flair and Lynch) will compete in a battle royal tonight. The winner of that match will be added to the title match at TLC. The Usos briefly talk about being the only winners from SmackDown at Survivor Series. Also, they will welcome The Bar to the Uso Penitentiary tonight. Good match. A lot of the first part took place during a commercial, so there were a lot of rest holds from The Bar as they controlled the match. Back from the break, The Usos started to gain momentum with some quick maneuvers. From there the match was back and forth and quite fast. There were a couple of good near falls before a satisfying finish. New Day tells Miz that his loss last week to local talent was his best performance. Miz says he and Shane were fighting through injuries sustained while they were defending SmackDown’a honor at Survivor Series. Miz says The Usos won the tag team Survivor Series match, and it didn’t even count anyway. Miz says he’s going to go get Shane McMahon and set up a match for tonight. AJ Styles sits alone in the dark. AJ Styles heads to the ring. He’s not happy. He’s been without the WWE for fourteen days, and those days feel longer than the 371 days he held the title. He doesn’t like losing, but the way he lost is what’s really bothering him. More specifically, it was the post-match attack from Daniel Bryan that bothered him the most. Bryan’s kicks caused Styles to not be cleared to attend Survivor Series or SmackDown last week. Styles thinks that the “new Daniel Bryan” is a bunch of garbage. He doesn’t care what Bryan has to say, he just wants to fight. He want to fight right now, but Daniel Bryan isn’t here. Bryan wasn’t at the live events this past week either. Styles thinks Bryan might be taking a cue from how RAW does things, but this isn’t RAW. Styles says he never missed a show as champ, because this is where he belongs. Styles says that Bryan can bring his dreams and excuses to TLC, but he better remember to bring the WWE Title, because that title belongs to AJ Styles. A promo video for Lars Sullivan. Shinsuke Nakamura heads to the ring for a match. Rusev comes out next, but Nakamura attacks Rusev as he enters the ring. Nakamura hits Rusev with two Kinshasas, then he leaves with his title belt. Rusev is down, and he’s not happy. The SmackDown Live roster, the 205 Live roster, and some crew members are on the stage, and Michael Cole is in the ring. Cole introduces Jeff Hardy, and Hardy heads to the ring. Cole introduces a video chronicling Jeff Hardy’s twenty years since signing with WWE (there a lot of shots of Jeff falling off of things, and a shots of the titles he’s won over the years). Jeff thanks everyone. He is thankful for the creative outlet he has had over the past twenty years. He is also grateful for everyone’s support in the good times and the bad. Jeff doesn’t know what is going to happen in the future, but he wants everyone to join him as we find out together. Samoa Joe heads to the ring. Joe congratulates Jeff on twenty years. He says he’s late to the party because he was thinking about bringing some champagne, but maybe bringing alcohol near Hardy isn’t a good idea. Joe is also glad Jeff got to see the video package of his WWE career since he probably wasn’t coherent enough at the time to remember any of it. Joe does not celebrate weakness, and he does not believe in second chances. It makes Joe sick that Jeff allows himself to be put on a pedestal after all the mistakes he made and after all the times he let everyone down. Next time Jeff feels powerless, Joe will be there to lend a hand. But it won’t be painless. Jeff Hardy says he has nearly ended his career many times, but he is still here. He’s had some great moments in his career, and he invites Joe to the ring to create another moment right now. Joe declines the invitation. Pretty good match. The draw here was Miz trying to cheat while Woods and Big E repeatedly thwarted him. The action was pretty good too. Randy Orton turns around to face the camera. Randy Orton heads to the ring. Orton has Rey Mysterio’s mask. Orton says people have described his actions last week in many ways, but Orton describes his actions as euphoric. He’s never bothered to learn the history of Rey’s mask, because he doesn’t care. Orton explains that what he did last week was meant to embarrass Rey and to bring him of the pedestal that the people have put him on. Rey comes out, and he’s wearing a neck brace. Rey heads to the ring, but Orton meets him at ringside. The two men brawl, and Orton quickly gets the upper hand. Orton removes Rey’s neck brace and rolls him into the ring. As Orton enters, Rey attacks and hits Orton in the side with a 619. He hits a second 619 to Orton’s head, then Rey goes to grab a chair. As Rey tries to get back into the ring, Orton grabs him and hits a draping DDT. Back outside the ring, slams Rey neck into the top of a steel chair. Orton leaves as Rey is attended to. The Miz asks Shane McMahon where he was. Miz is frustrated that Shane isn’t trying to be a part of their team. Shane says they don’t have a team. Miz counters by saying that the WWE World Cup trophy makes them family, and he wants Shane to start acting like it. This felt kind of short for a battle royal, but the last couple of minutes were fun. I think the result is what matters most here, and I was happy with that. This episode was light on wrestling, but I mostly enjoyed what I saw. There wasn’t a lot to choose from tonight, but the last few minutes of this match were the best part of the night.